How could I make Thunderbird show the e-mails? Last edited by smsmith on February 20th, 2019, 4:30 pm, edited 1 time in total. How is the account set up in Thunderbird, as POP or IMAP? Find out using menu path Tools->Account Settings->Server Settings->Server Type at the top right of the dialogue. Close Thunderbird and navigate to your Profile Folder ( http://kb.mozillazine.org/Profile_Folder ). Find the file Sent.msf. . Note that there will be two files with the name Sent but only one of these will have the MSF extension. Delete the files with the MSF extension. Restart Thunderbird, compact the Sent folder, and see if things are back to normal. Note that the MSF files do NOT contain your messages. They are, for lack of a better term, an index file and will be recreated by Thunderbird as required. The messages in the folders under "Gesendet" ("Sent") are shown like usual. And there does not seem to be any corrupted messages as far as I can see. They just are not shown in the Sent box. Does that mean that you have 77 Sent folders (and therefore 77 accounts) in your Thunderbird profile? Or were some of those .msf files associated with sub-folders of the Sent folder? If you close Thunderbird and open a file with the name Sent (and no file name extension) in a text editor, is there message data present in that file? 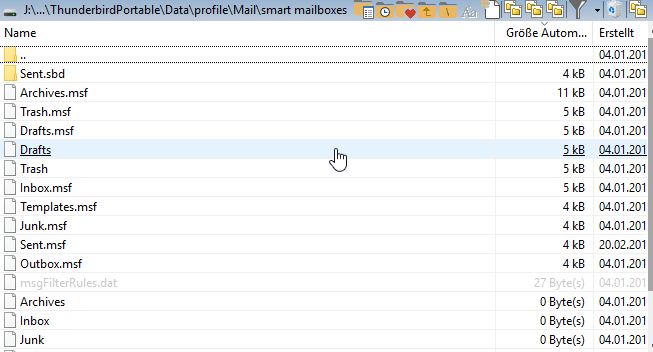 If you can see the contents of individual sent folders but they are not visible in the top level sent folder than its probably a corrupt "smart mailboxs" directory used by view -> folders -> unified. Use "Help -> Troubleshooting Information -> Open Folder" to display the contents of the profile using windows explorer (or whatever file manager you are using). Then exit Thunderbird and delete the "smart mailboxes" directory within the Mail directory. Start Thunderbird. It will automatically rebuild that "smart mailboxes" directory. Does that mean that you have 77 Sent folders (and therefore 77 accounts) in your Thunderbird profile? No, it cannot mean that, I have about 10, 15 accounts / e-mail addresses. Or were some of those .msf files associated with sub-folders of the Sent folder? Sorry, I do not know, I just have marked the msf files after having found them with a kind of search option and just delelted them. I cannot see sub folders in the Sent folders in TB. Yes, now the top level Sent folder shows the messages again since years, great. The columns in the e-mail panel are messed up now of all the acccounts obviously. 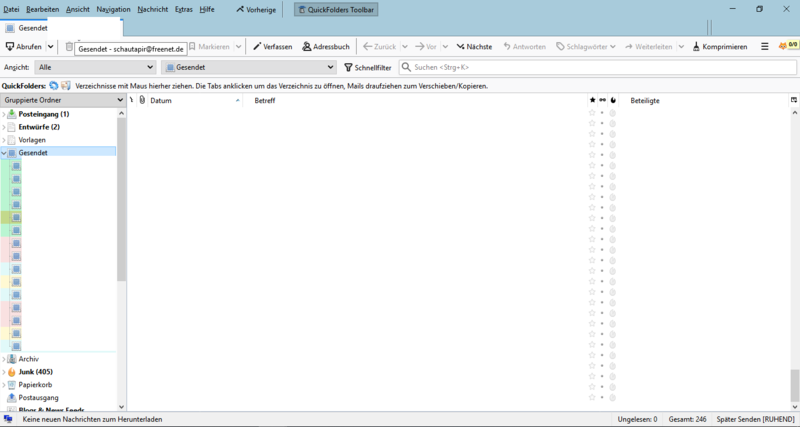 Your screen shot shows a (unified) "Sent" folder for which you have chosen the "View" "(Ansicht" in German) : "Unread" ("Ungelesen" in German). By default sent messages in the Sent folders are marked as "read", so if you choose the view "unread" there won't be any messages displayed in the thread pane unless you switch to "All" (messages) in the "View" button drop-down menu. This is unbelievable, I never have noticed that, indeed, it seems as if that was the "problem", I just started the back up of my Thunderbird, made a few hours ago and when I switch from the Inbox (View "All") to the top level "Sent" folder the view automatically switches to "Unread". Setting it to "All" shows all of the messages. And when I click a folder beneath the top level folder (view "Unread") the view switches to "All". Incomprehensible, so that obviously was the cause all the years. But why at all is there a view for sent messages not to be shown if they are unread? The Unread view is not specifically intended for Sent messages. Some people may have many messages in the Inbox or other folders and using the Unread view allows them to focus on messages they have not yet reviewed. The Unread view can be used on all folders so occasionally a user may find a folder, such as Sent, with no unread messages which will make it appear that there are no messages in the folder. I'm sorry that I missed that selection in your screen shot. I'm aware that "Ungelesen" means unread but did not catch that that filter/view was active. The Unread view is not specifically intended for Sent messages. Yes, I would think so, too. So one could think, if it is like that, why doesn't Thunderbird automatically turn the unread view off when switching to "Sent". Some people may have many messages in the Inbox or other folders and using the Unread view allows them to focus on messages they have not yet reviewed. Yes, that is the way I am doing it sometimes. No no, no reason to say sorry, I had missed it all the time glad it works now, many thanks. So one could think, if it is like that, why doesn't Thunderbird automatically turn the unread view off when switching to "Sent". There are as many different ways to use TB as there are users. It's possible that some users copy or move unread messages to the Sent folder. Automatically turning off the "Unread" filter would be an issue for them. Or, it's possible that the developers just never considered that the Sent folder would not have unread messages present! There are as many different ways to use TB as there are users. May be not that many. There will be groups using it the same way one could say. It's possible that some users copy or move unread messages to the Sent folder. Yes, that could be, for what reason? Or, it's possible that the developers just never considered that the Sent folder would not have unread messages present! Yes, may be that is the reason why it is available there.